All / each of the different Borderlands 2 gun manufacturers have a specialty that makes their brand or company different than others. Some of these may be more or less useful to you. Check our list of all of the Borderlands 2 weapon manufacturers below. Bandit - These guns have extra large magazine clips so that you can pump your enemies full of bullets! Dahl - These have the special feature of increased stability, accuracy, and burst fire. Hyperion - High accuracy that increases while firing. count the AMP power that some shields have or shields with spike damage / nova damage. What's the best weapon really depends on what's best for your class and play style. However, there is a weapon that is considered the best weapon in Borderlands 2. It's a shotgun called Conference Call. All of them share one common factor -- the special effect red text that says "Let's just ping everyone at once." This adds a special secret effect that makes it so the shotgun shoots extra shots that go horizontally towards the enemy, thus covering a lot of ground and doing increased damage. You can get this shotgun by killing The Warrior at the location: Vault of the Warrior. Farm him over and over. This IS a rare loot drop so it could take you many tries. If you join this with The Bee -- a legendary amp shield (check Borderlands 2: Best Shield in the Game & Info) then you can do incredible amp blasts with the shotgun. 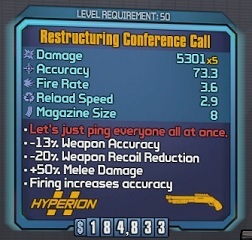 A question / answer area on Borderlands 2 weapons. Q: Are E-Tech or Seraph weapons better than normal or Legendary weapons? A: All weapons are generated by the game randomly (for the most part). As such, while they CAN be stronger than normal or even the more elusive legendary weapons, they can also not be. It should be noted that most people agree that Seraph weapons are NOT as strong as a lot of weapons that can be found in the game. Q: Is there a gun stronger than Conference Call? A: While Conference Call is regarded as the best gun in the game -- you can find an alternative that is better than this. There's no specific gun to name, as numerous guns can be generated that are better. However, they won't have the same special effect as Conference Call -- which is a big part at what makes this shotgun so great. Q: Do the Borderlands 2 Vending machines ever have good weapons? A: Yes. While it seems to never happen, you will encounter good, rare guns and grenade mods from the vending machines (such as an Item of the Day). It does NOT happen often.